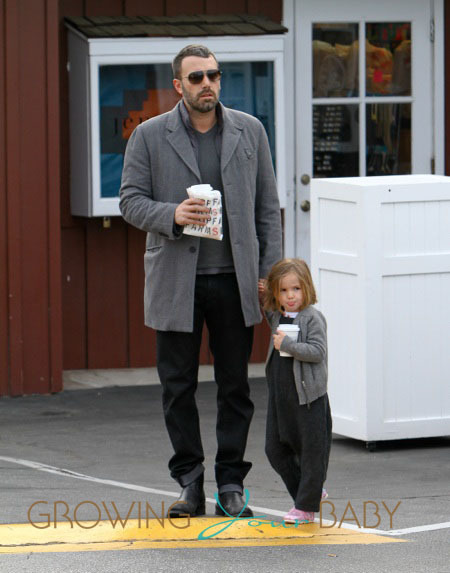 Ben Affleck was photographed out doing the coffee run with his youngest daughter Seraphina at the Brentwood Country Mart in Santa Monica on Wednesday. Seraphina showed off her new bob hair cut, while wearing a black jumper and grey sweater. Ben matched his little lady in black pants and a grey blazer. The pair looked sweet holding hands as they carried their warm beverages back to the car. The coffee run seems to be a daily ritual for the Afflecks. Jen Garner, Ben’s wife is often spotted at the same cafe grabbing java and snacks with the kids. The outing comes just a couple days after the whole Affleck family was spotted spending some time together at the park. With both Ben and Jen in between projects, we hope to see them out together more.